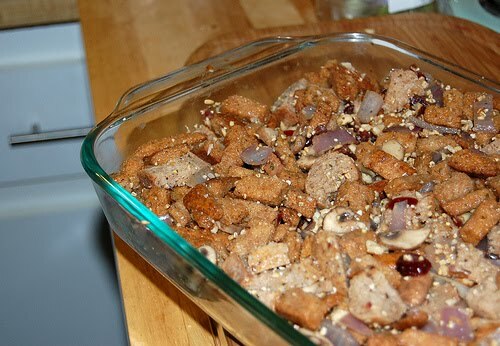 In honor of next week's big holiday, I thought I'd go through the METHOD archives to find my absolute favorite stuffing recipe. It truly transcends usual holiday fare and often makes an appearance at our dining room table in the off season, so you KNOW it's a keeper. Heat oil and add onion, saute until translucent. 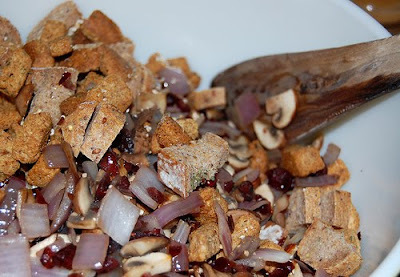 Then add mushrooms and cranberries, saute another 5 minutes. In a large mixing bowl, combine croutons with the onion/mushroom/cranberry mixture . . . and then add everything BUT the vegetable stock. Then, add the vegetable stock to the mix slowly . . . turning with a rubber spatula (or your hands) to combine. Transfer everything to a shallow 1-1/2 quart baking pan (ours was a different size), and bake 15 minutes. Stir mixture and bake another 10 to 15 minutes. NOTE: You may need to add more vegetable stock depending on how wet or dry your stuffing turns out. Just add liquid 1/4 cup at a time to be safe (and not too soggy).